I don’t have any local needlepoint shops near me. The closest one that carries Silk and Ivory is two hours away, I’ve been there twice in the past two weeks... 8 hours of driving for needlepointing! I’m designing a very special and limited edition Boca Grande goodie for an auction here on the island. Although I kit needlepoint for a living, sometimes I just need to get in front of a wall of fibers, hold all the colors in my hands and move them around and look at my options to pick the perfect palette. (This is also how I choose fibers for paquets.) I did this wall worship yesterday at Needlepoint in Paradise in Naples, Florida. While I was waiting for something else (I will tell you about later) I made myself comfortable in a sitting area and saw a very proud and excited grandmother buying her two grandchildren childrens’ kits. The little sweet shy boy who was about 5 got an apple, and his bouncing, jumping for joy 7 year old-ish sister got a unicorn. It really took me back as I watched this little girl who was seriously bubbling over, tip toeing dancing around waiting for her kit to be rung up. She could not contain her absolute joy. I watched and thought.... who knows where this will take these children, their own families, and the needlepoint community. I thought of my own cherished grandmother. I thought of the numerous grown men who have told me in this past year that they know how to Needlepoint because their mothers taught them as teens. This photo is of my grandmother, Martha Alexandra Thompson Thorn. Both she and my mother taught me to Needlepoint when I was 6. My mother would pass away unexpectedly the next year and my grandmother would continue to nurture my love of fiber arts. We lived in a tiny one square mile town called Bronxville in the suburbs of New York City. My grandmother also loved dollhouses and together we would knit miniature blankets and needlepoint rugs for our small houses. My grandmother would bring me to the fiber shop in the next town often. She was an avid knitter and seemed to go in frequently to ask questions about things like putting sleeves on the sweaters she knit for me. (Yes, I was that child in the class who only had hand knit sweaters with mother of pearl buttons, over my Danskins!) While at the shop I would pick up needlepoint kits. I dabbled in childrens’ kits for years until I was a teen and I finished a project for my grandmother when she could no longer see 18 mesh canvas. This first major project I stitched was 12x12 pillow on 18 mesh which sits in my stepmother’s home in Bedford, NY. I’m always in awe when I pick it up and see stitches going in all directions and a random display of way too tight tension. No one ever told me there were so many mistakes! (And I’m so grateful now, because I never knew, my enthusiasm was not squelched). Maybe Grammy (above) is the real muse for my last blog post about there being no wrong ways to make your art!! My grandmother’s love and nurturing of needlepoint left behind a legacy none of us could have imagined. In this photo she is holding one of her three great granddaughters. That little watermelon clad babe is Brooke, the founder of Thörn Alexander! 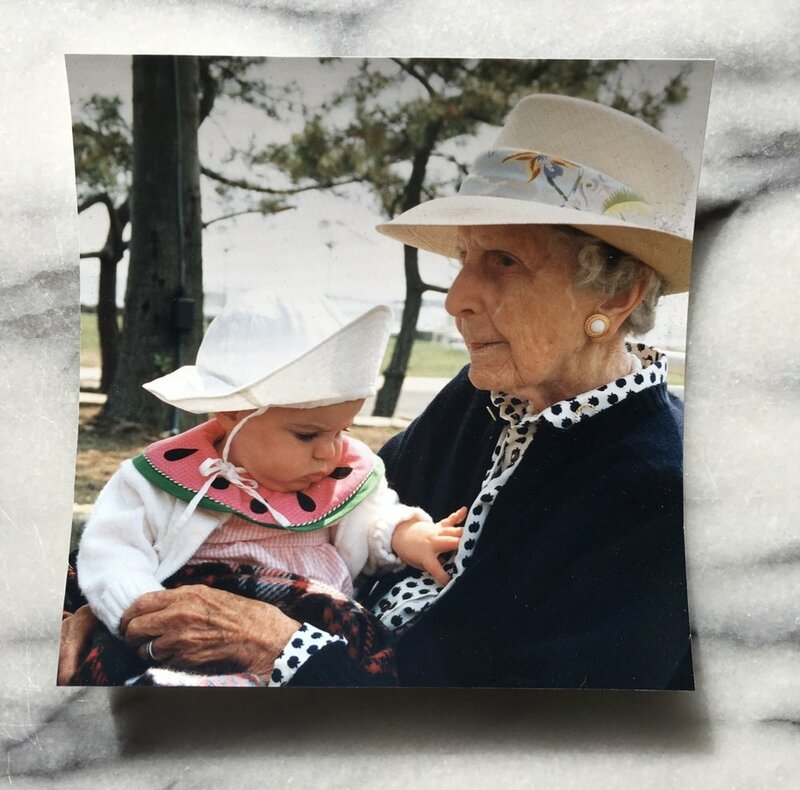 This needlepoint teaching grandmother is holding a baby who would design needlepoint which was photographed by and published in Better Homes and Garden 23 years later. I just can’t even imagine how very proud she would have been. In my stash of current projects are four projects for my great nieces, my grandmother’s two youngest great great granddaughters Madison and Taylor. In fact, as I sit here and type it occurs to me that Martha’s granddaughters, and great granddaughters are ALL stitching designs painted by that very baby above. If you give a mouse a cookie... I mean if you give a young person a Needlepoint... you never know where it will take them!